In school, we learn that there are 7 Ps in the marketing mix: product, place, people, process, physical evidence, promotion, and price. Traditionally, each of these P’s has been an important way to differentiate your company from the competition. Whether it was the quality of your product or the location of your store, these P’s served as sign posts telling your customers why they should buy from you. But do each of these P’s still hold up in the 21st century? The short answer is yes, but the importance of each is changing. Today’s retail market differs vastly from the 1990s and the 2000s, and the internet has fundamentally changed the retail sector. Consumers now have the power to comparison shop instantly. The rise of online shopping also eliminates the need for physical stores and opens up competition to the entire internet, not just the physical locations nearby. These changes have a huge impact on the way retailers should manage their marketing — and which P’s they should pay attention to in the marketing mix. As the internet has leveled the online playing field, one P has emerged as the clear focus for most consumers: Price. In this blog post, I’ll explain how price became the most important factor in the marketing mix, and how retailers can use pricing data to increase their marketing ROI. As you can see, the internet has made all but two of the 7 P’s less important: Pricing and Promotion. How a person finds your product online, and how much the displayed price is, are the most crucial checkpoints for retailers to make a sale online. Considering this, it might seem like Pricing and Promotion share equal importance in the marketing mix. But the reality is that Pricing stands far above Promotion because Pricing controls Promotion. In fact, pricing is the single most important factor to consider while managing your online marketing product ads on platforms like Google Shopping. To show how important pricing is to marketing, let‘s look at a real-life example of the relationship between the two. In the graph below, you can see two metrics over the course of two months: a retailer’s pricing and the number of units sold. The line graphs represent the price and the bar chart at the bottom shows the number of units sold. A margin-focused strategy from the beginning of July to the 24th, where the retailer is priced higher than the market average. An aggressive strategy from the beginning of August until the end of the data where the retailer is priced lower than its competition. Looking at the number of units sold during this period, it’s obvious the aggressive pricing strategy resulted in more sales. All other conditions staying the same, the simple change in price led to a dramatic change in sales. It’s important to note that more sales do not necessarily lead to more bottom-line margin. Although there might be a high volume of sales, the prices (and margins, as a result) might be lower. But you can use this information strategically to decrease prices on select items and draw traffic to your website. Now that we’ve shown the importance of pricing in today’s marketing mix, let’s dive deeper and examine their interactions. The price of a product online determines how much margin that product will make, a portion of which can be used for marketing. If the product has high margins, marketers have more money to market a product. However, if a product has lower margins, there is less money for a marketing strategy. When you are priced lower than your competitors, the chance customers will click on your ad and buy your product increases. These higher click-through rates (CTR) and conversion rates are signs of healthy, effective marketing campaigns. 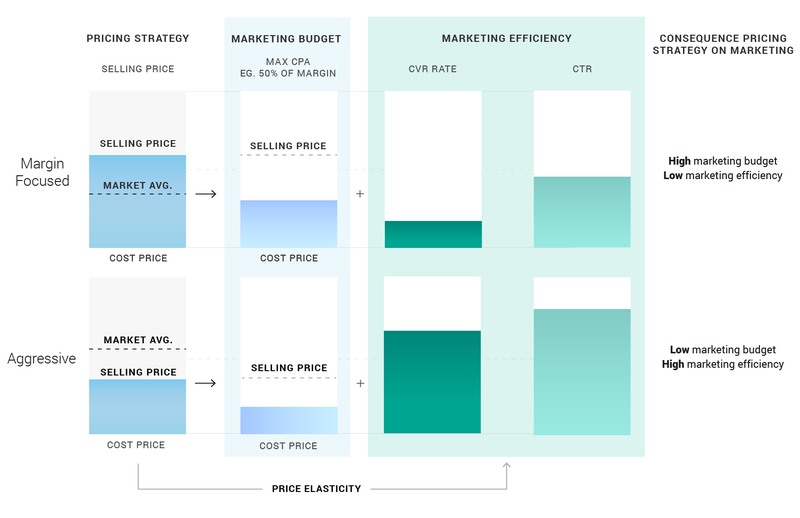 So if a higher price creates a bigger marketing budget, but a lower price increases the effectiveness of your campaigns, there is a clear challenge. How do you find the right price that it optimal for both your marketing budget and efficiency? This question gets more complicated when you consider that this balance is different for every single product on the market. That’s because consumers value items differently and respond accordingly to price changes. This is called the price elasticity, and it is a phenomenon that retailers need to consider in their pricing strategies to optimize margins. For example, an increased price for a popular TV will most likely lead to a significant decrease in CTR and conversion rate but an increased price for a TV wall mount (often sold along with the TV) may have negligible effects on click through and conversion rates. You can use this information to pair items together strategically and maximize profits. As a result, you will need to adjust your marketing bids with each price change. Each time you — or one of your competitors — changes the selling price of a product, the CTR and conversion rate will also change for that specific product. But doing this manually is nearly impossible, which is why you need to find an integrated way of managing pricing and marketing. So, now that we’ve established the impact of pricing on marketing, let’s discuss how to take advantage of this phenomenon. Although pricing is the #1 factor impacting online marketing results, it is still rarely used as input for marketing management. Without pricing context, it’s hard to evaluate the performance of online marketing campaigns. Let’s take another look at the earlier graph of historical pricing data. The online marketing department will probably be satisfied with the performance in the periods of aggressive pricing strategy, but wonder why conversion rates dropped during the margin-focused periods. 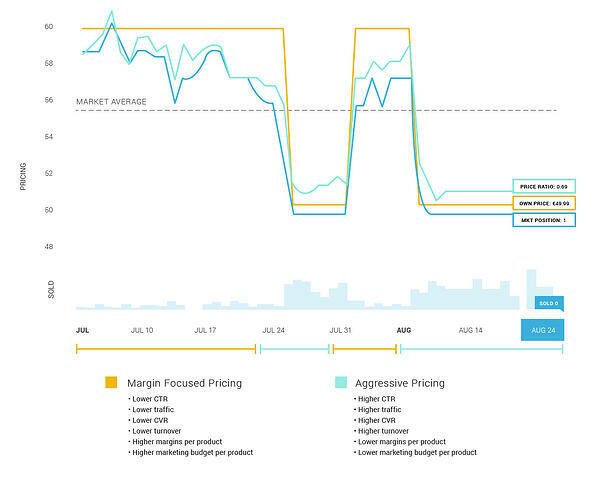 If they had access to pricing data, they’d be able to understand why these changes occurred: during the aggressive pricing periods, there were more clicks on the product because the price was low, but during the margin-focused periods the online marketing was less effective because of a higher price. They‘d be able to use that input in future marketing campaigns and prevent wasted ad spend on out-priced products. If you manage your pricing and marketing strategies separately, you can still use the pricing data as fixed input for the marketing department. 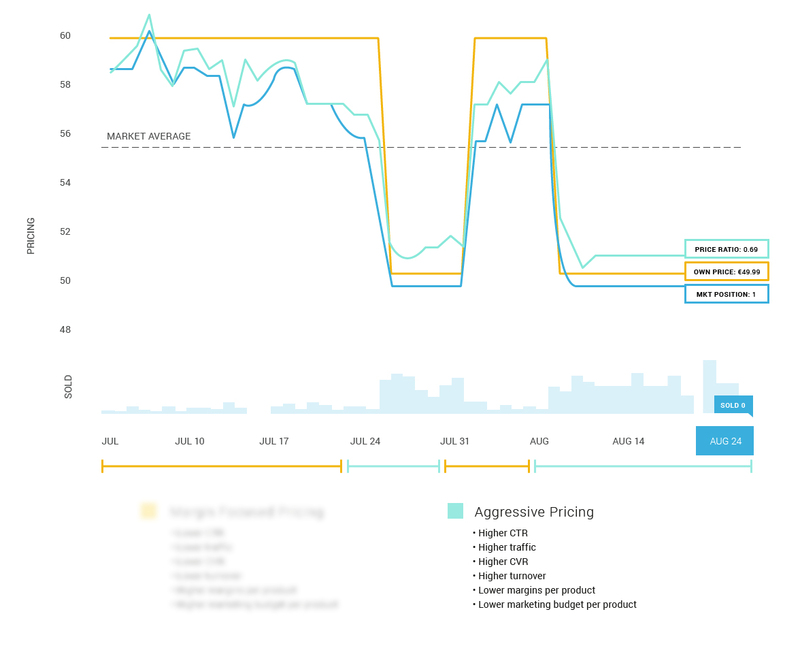 In the above examples of margin-focused and aggressive pricing strategies, the historical data shows how this product reacts to price changes. With this information, the marketing team can change bids to match new price levels, which will increase your ROIs. For example, if the price ratio (which is your price vs. your competitor’s prices) changes, the marketing team can proactively change bids marketing to match the expected performance at the new pricing level. But this strategy isn’t foolproof. Marketing can only work with the pricing information they’re provided, a data set which requires a significant amount of work to find. 3. Integrated management of dynamic pricing & marketing. When you fully integrate your marketing with Dynamic Pricing, the data becomes powerful. At this point pricing is not just a fixed input for marketing. Instead, the selling price itself is also adjustable. With this dynamic input, you can find the perfect balance between pricing, marketing budget, and marketing efficiency. This ensures marketing is effective, but also creates enough margin to ensure a healthy marketing budget. So, is this the full answer to pricing and marketing integration? Unfortunately, it isn’t. 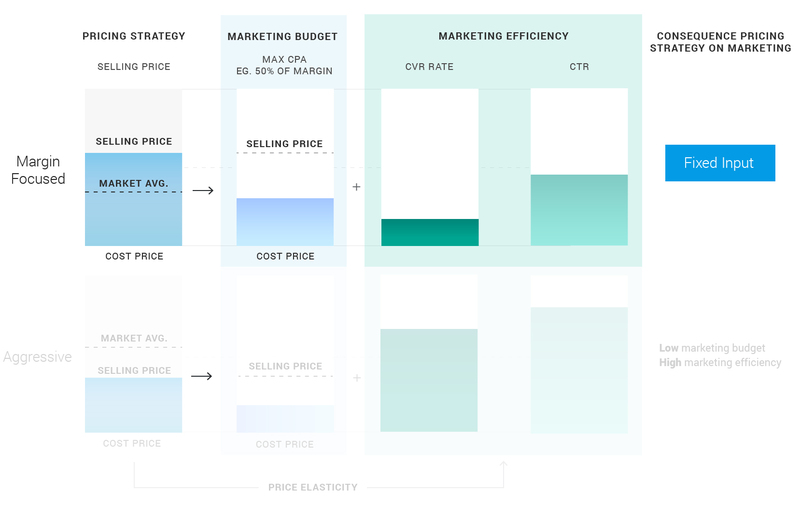 The above example is a simplified situation, and it doesn’t fully cover all the intricacies of the relationship between pricing and marketing. To uncover that answer, we need to go one level deeper. It will get a little murky at first, but all becomes clear soon. The combination of your marketing budget per product (the CPA) and the marketing effectiveness predict which CPC bid is still profitable to sell a single product. However, it does not yet predict the amount of traffic you expect to generate for a specific product over a given period. Without that traffic information, you can’t predict the overall bottom-line results your marketing campaigns will generate. In terms of overall turnover and profit of the online campaign, you are still in the dark. Adding traffic information illuminates this information and gives you a better decision-making framework to use. The impressions and the click-through rate determine how many clicks you can generate. It’s important to remember that the display price also affects the CTR. The clicks, together with the conversion rate and pricing level, lead to the overall bottom-line performance. Finding the right balance between all these parameters is an enormous challenge. With the widget below, you can try to find the right balance yourself. Change the selling price, marketing budget and price elasticity as input and see if you can find the optimal turnover and profit. You’ll notice that finding the optimal balance here is challenging. And here’s the thing: this widget represents the interaction of just one product. Now imagine going through this for your complete assortment, every single day, while your prices – and your competitors’ prices – change every few hours. The process becomes impossible to do manually and underpins the need for automation to help you sort through the information. When you integrate your pricing data with your online marketing strategy, you can find the perfect balance between price, marketing budget, and marketing efficiency. The pricing insights, combined with a number of other KPIs and metrics give marketers the information they need to make smarter marketing choices and bids. 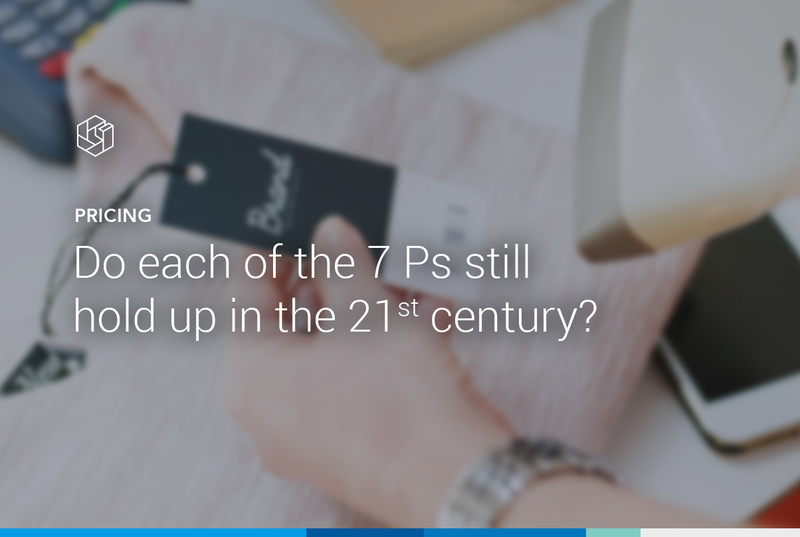 That‘s why Out of all the 7 P’s, pricing has the largest impact on online marketing. But many online marketing management teams still don’t recognize the power of pricing data or use it to its full potential. And for those who do recognize the possibilities, there isn’t an easy way to execute the strategy manually. Omnia‘s pricing and marketing automation software makes this connection possible. With Omnia, you can manage your feeds, adjust your bid strategy based on pricing information, and track pricing information all in the same portal. Interested in learning more? Download your free copy of Why Pricing and Marketing Go Hand-in-Hand to get the full story on the importance of pricing and marketing integration. Click the button below to get your copy today!